We offer our clients products and services that implement the idea of Edutainment, that is, those that teach and play. We provide teambuilding programs and trainings for business groups based on the principle of "experiential learning". As a laureate of many industry awards and distinctions, among others MP Power Awards, Business Excellence Award or Outstanding Industry Achievement Award, we feel empowered to promote "experiential learning" in the area of training and events. We designing innovative workshops, custom games and even extraordinary conferences or jubilees for companies. We are the exclusive representative of Catalyst Global in Poland - the largest organization bringing together recognized teambuilding companies around the world. Thanks to this partnership, we can offer our clients the richest offer of selected games and programs in the spirit of Edutainment. Teambuilding is an indispensable element of every company's development. We base our strategy primarily on the understanding of the clients' business needs. What counts for us is the development of people through interactions, emotions and reflections from experience. We are constantly looking for new ways to stimulate commitment, develop competencies, improve communication and strengthen loyalty, which lead to one goal: to build more effective organizations. Join us and receive information about the projects that we implement and inspirations on how to motivate the team and influence the company's performance. 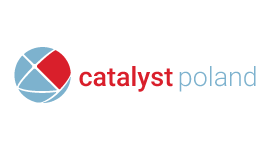 We are also Catalyst Poland!